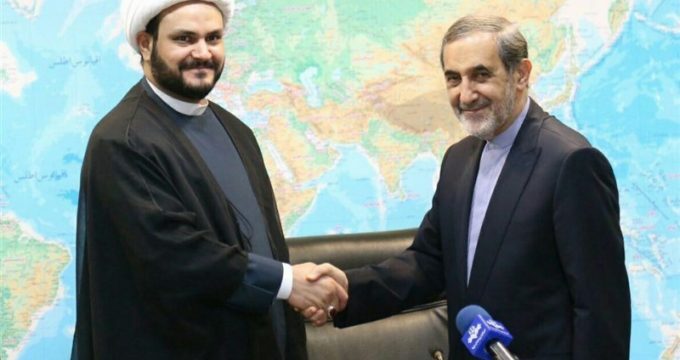 TEHRAN (Tasnim) – Ali Akbar Velayati, an international adviser to the Leader of the Islamic Revolution, praised the Iraqi nation for its contribution to regional stability by forcing the US to leave the Arab country after fall of former dictator Saddam Hussein. If the Iraqi nation had not terminated US control over the country after toppling Saddam Hussein’s regime, Iraq would have been lost and the region’s stability would have been totally upset as well, Velayati said in a Thursday meeting with Sheikh Akram al-Kaabi, Secretary General of Hezbollah al-Nujaba, a major Iraqi Shiite resistance movement fighting Daesh (ISIL or ISIS) terrorists. Velayati further hailed the Iraqi nation’s success in fighting off the Daesh terrorist group, referring to the Iraqi religious authorities and people’s obedience to their guidelines as a main factor in the victories. He also pointed to the establishment of democracy in Iraq –which he described as unmatched in the Arab world- and the victories gained by the Iraqi voluntary forces (known as the Popular Mobilization Units or Hashid al-Shaabi) as some other elements contributing to the defeat of Daesh. Since early 2014, Iraq has been facing a growing militancy by the Takfiri Daesh terrorist group and its allied militants, who have taken over areas in the country’s west and north. Daesh is threatening all communities In Iraq, including Shiites, Sunnis, Kurds, Christians, and others. In recent months, the terrorists have been forced by the Iraqi army and voluntary forces to retreat from many of the areas they had occupied.